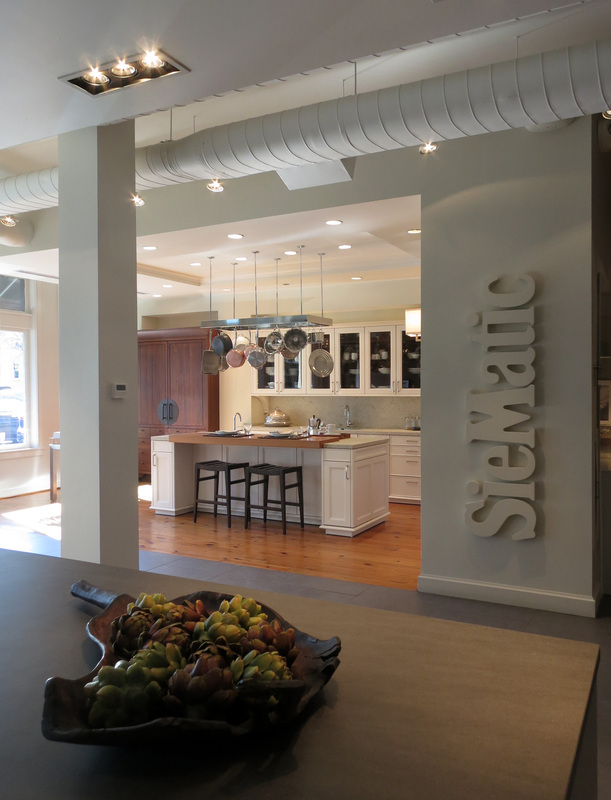 Our latest showroom design for SieMatic is now open in Bethesda, MD. Konst – meaning “art” in Swedish, is owner Jonas Carnemark’s third studio renovation/location in a decade. Locking down a busy corner of Wisconsin Ave. near the Bethesda Metro station, this latest move – just a block away from the old building – is a gigantic leap in street and sidewalk exposure. 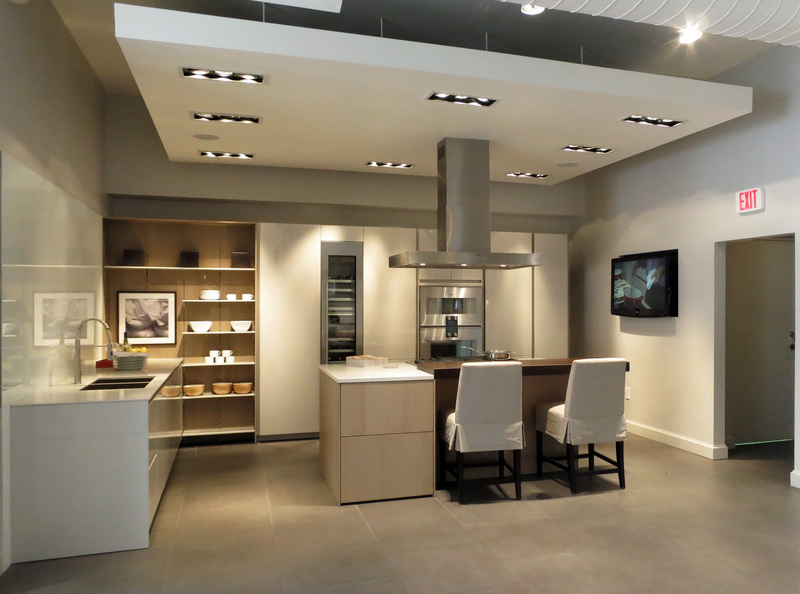 Our previous showroom space was constructed over two renovation phases, which left an incongruous layout from end-to-end. 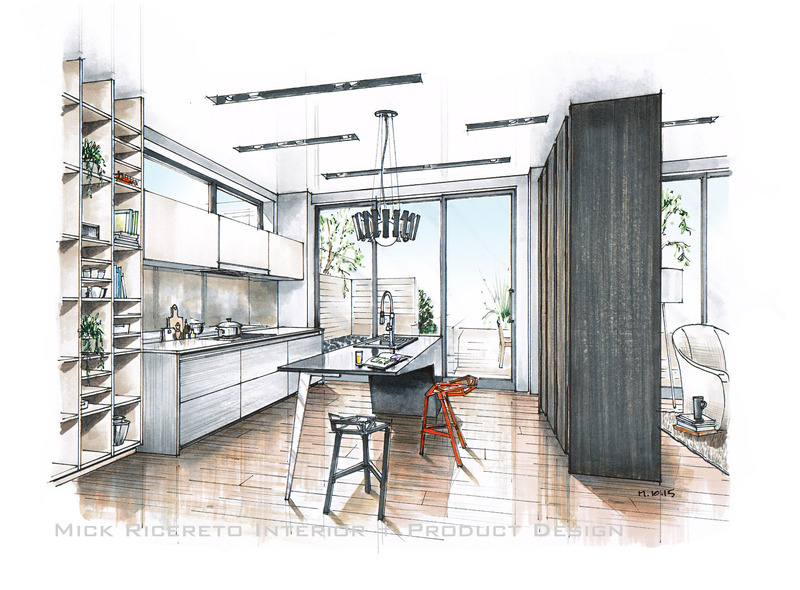 This new space is more linear, showing a straight progression of SieMatic design as one enters and meanders counter-clockwise around the space. This view from opening night in early October shows the great storefront exposure on the front of the building. 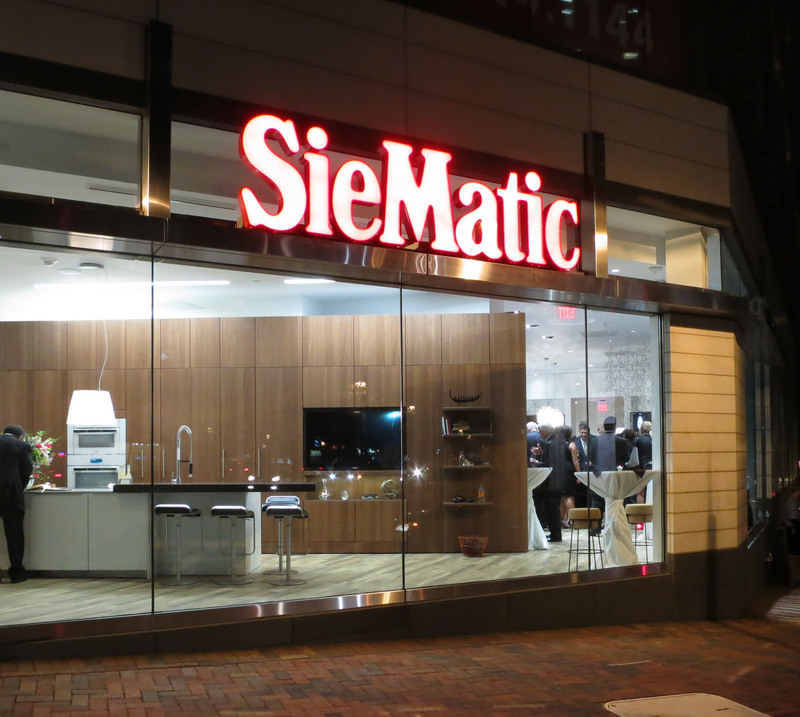 As motorists and pedestrians come down Wisconsin Ave towards Washington DC, this large SieMatic logo beckons proudly on the modernist façade from blocks away. 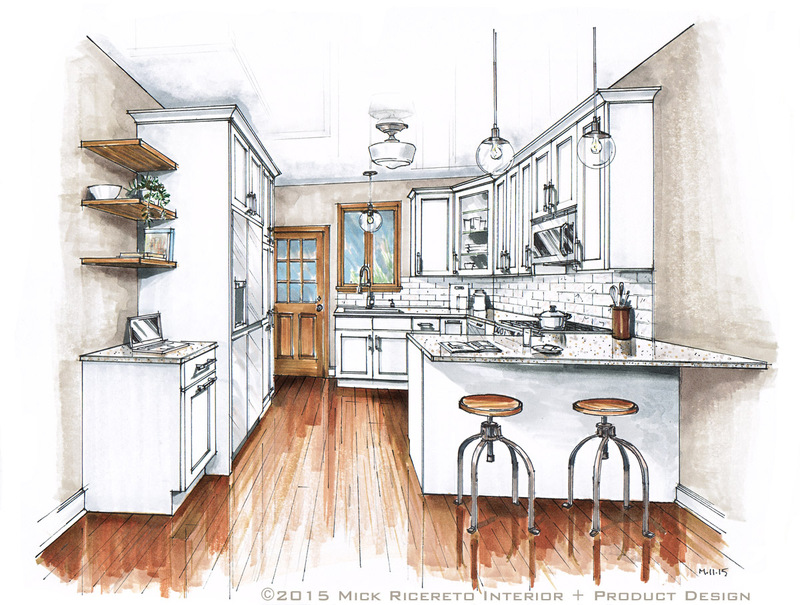 The first display consists of a simple white laminate island positioned before a large, continuous-grain natural walnut cabinet wall. 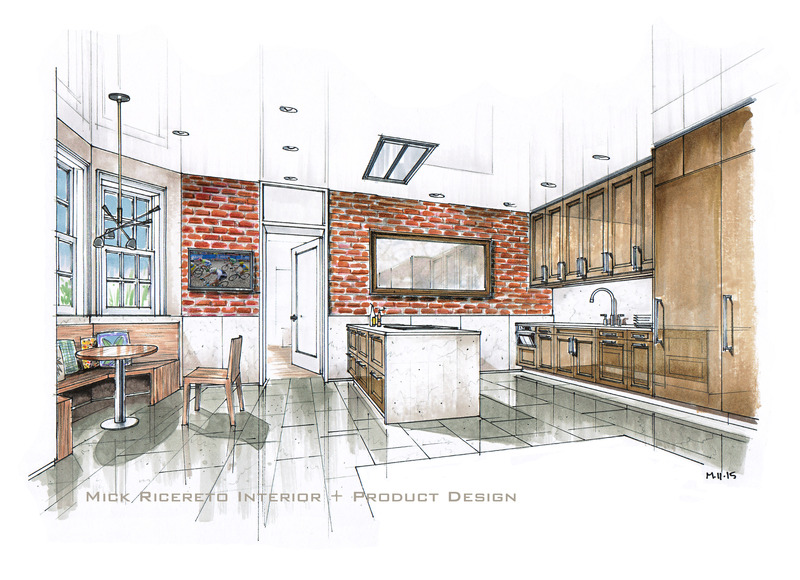 Behind the paneling are fridges and freezers, hidden storage areas and audio-visual equipment. The building features a large chamfered corner on Wisconsin Ave, so we chose to angle the front display parallel to this edge. Keeping the floor longitudinal but aligning the LED ceiling strips adds dynamics to the youthful room feel. 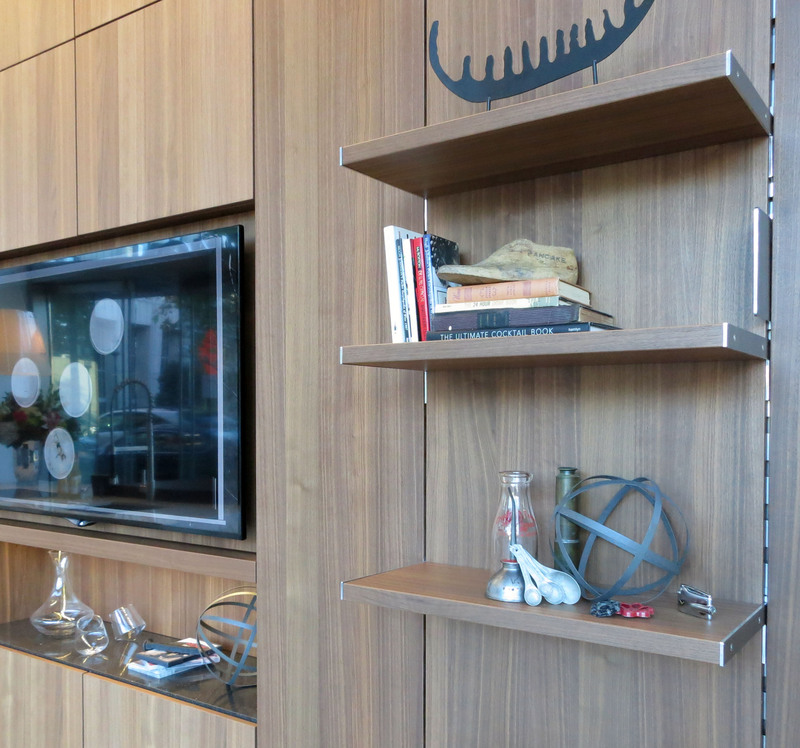 While most of the storage is closed and otherwise hidden, we added a Floating Spaces shelf to the end for accent. 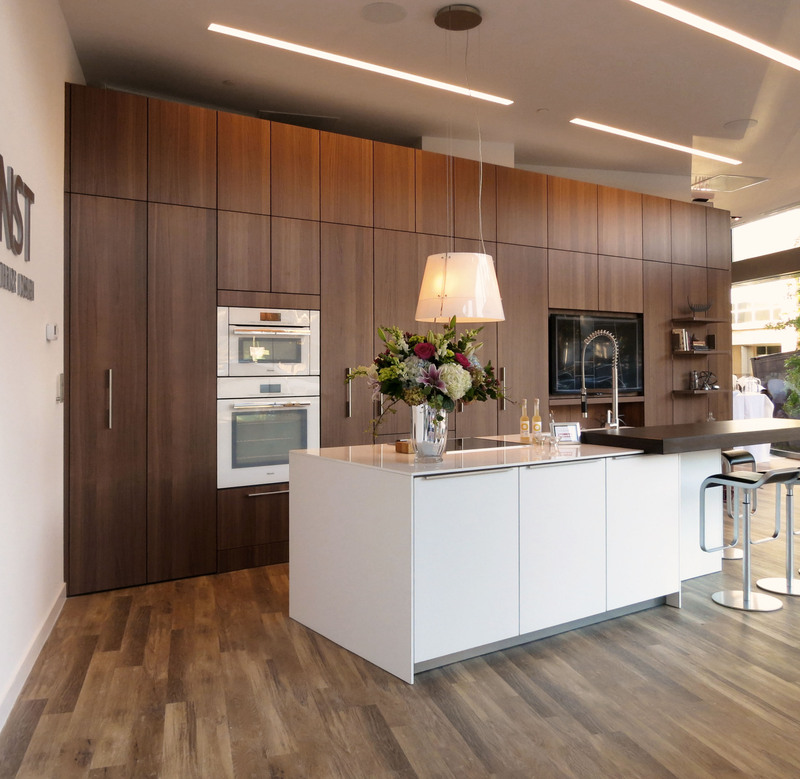 A large display monitor shows loops of SieMatic and Konst design features while Miele’s latest white glass appliances make a bright accent on the left side for balance. Visitors walk around the right side of the display for their first look of display 2 and the rest of the space. 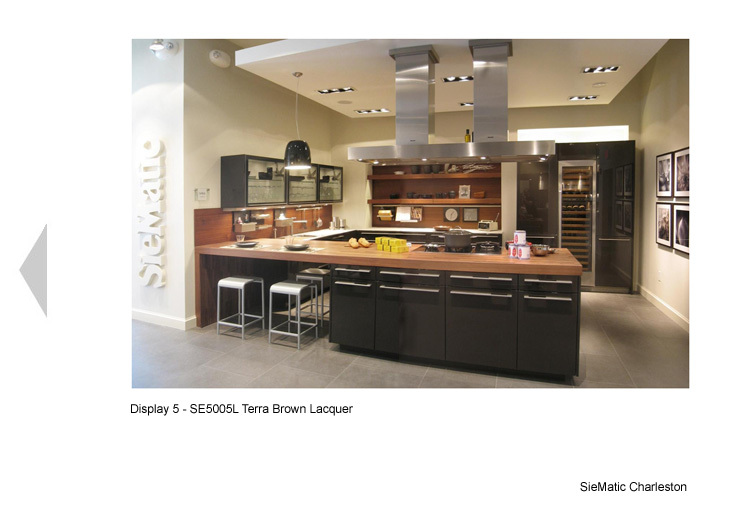 The second display presents a large suite of space with S2 in Oak and SLG “similacque” glossy laminate, adjacent to the Beaux Arts 2.0 display at the rear. A SieMatic table and benches is just out of view behind the Algue screen by Ronan & Erwan Bouroullec for Vitra at left. 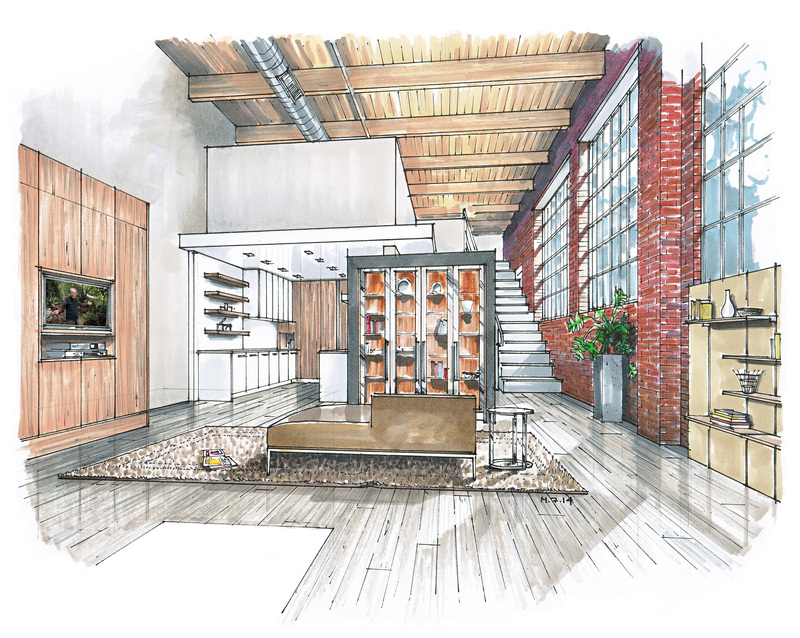 The Beaux Arts takes up the anchor space at rear with a large seating area, media center/fireplace and entrance to samples areas and service space. 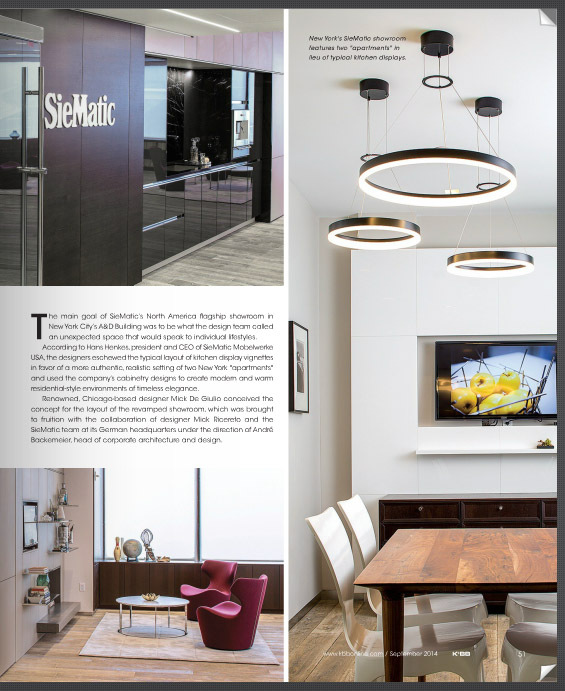 The display follows SieMatic’s usual Beaux Arts philosophy of using metal, gloss lacquer and wood and asymmetrical balance to create this unique feel. With these photos taken only a few minutes before the opening party, I’ll need to return for more pictures of details and the seating areas. We are particularly proud of this latest studio, and wish the staff at Konst the best luck at this new location. Based on the level of interest passersby expressed during my site visits – as well as the tremendous response on opening night – I’m sure this location will prove more successful than their old spaces. Visit Konst online and browse the excellent work they have been doing for the past few years and do make sure to drop in when in the Washington DC/Bethesda area. 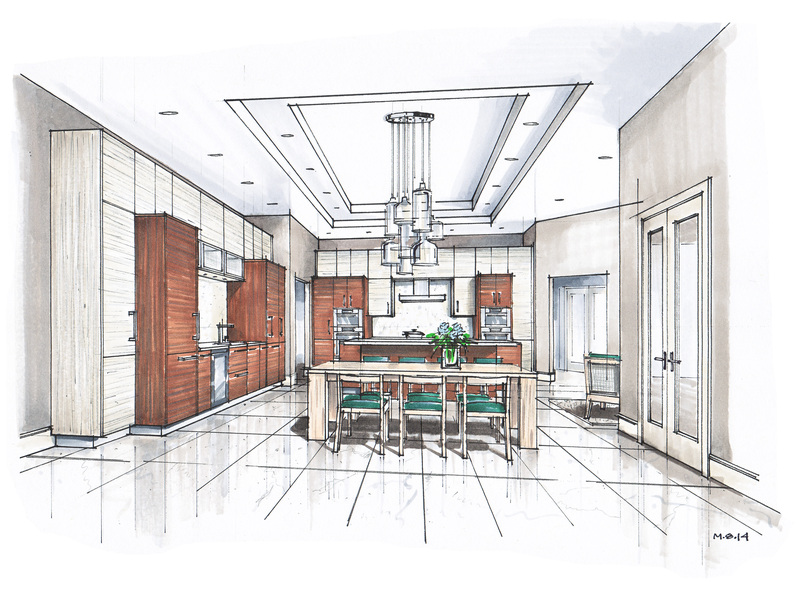 It’s been 5 years since we completed the original installation for SieMatic Charleston. 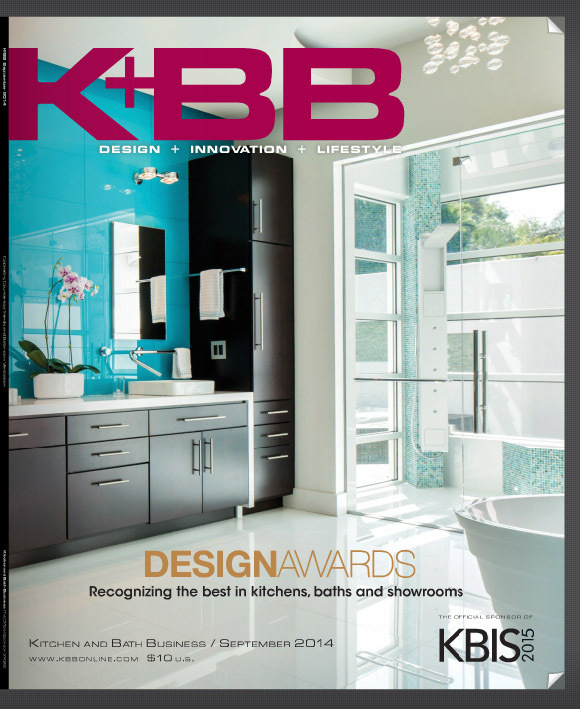 That showroom won us the Kitchen & Bath Business magazine Showroom of the Year award for 2009 (Link to KB&B Article). 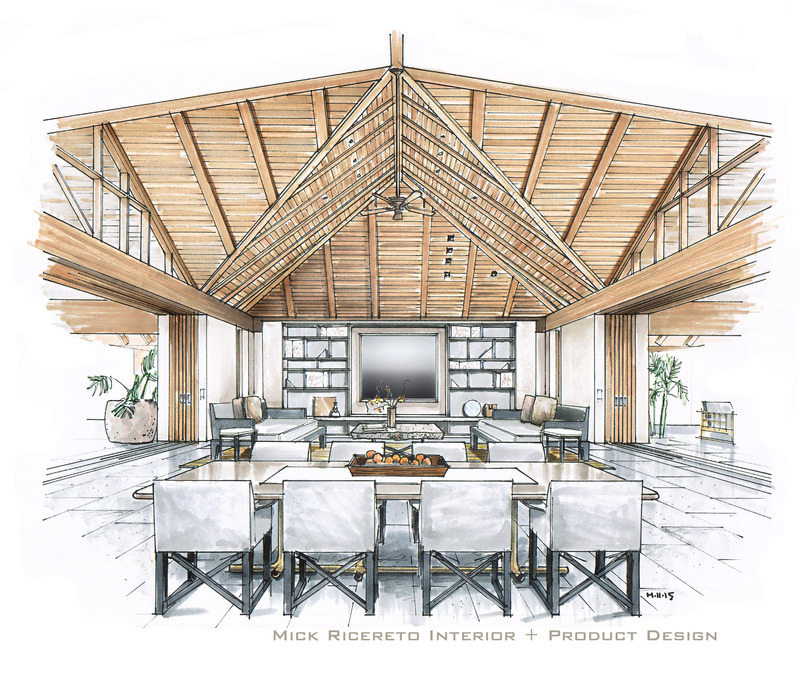 However five years is a long time in the luxury furniture industry, and innovators should be prepared to change out a display every 1-2 years to maintain authority over trends in materials and design. 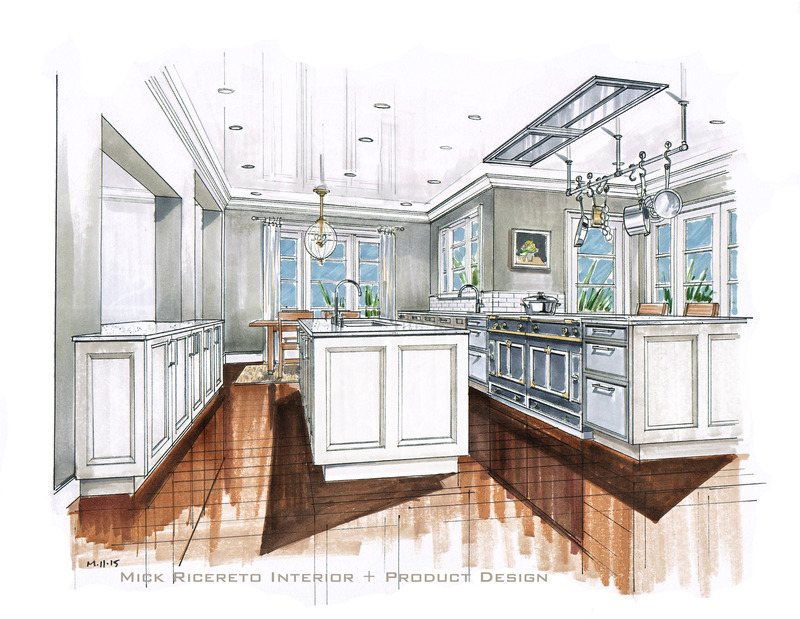 SieMatic NYC and Charleston are good illustrations of this thinking. The Charleston design team was fortunate to have sold off some old displays just as new product was coming out of Germany, so we were able to do the latest here. This first display, in the front window, is very modern in layout with a long rectangular island in Agate grey lacquer and natural walnut. 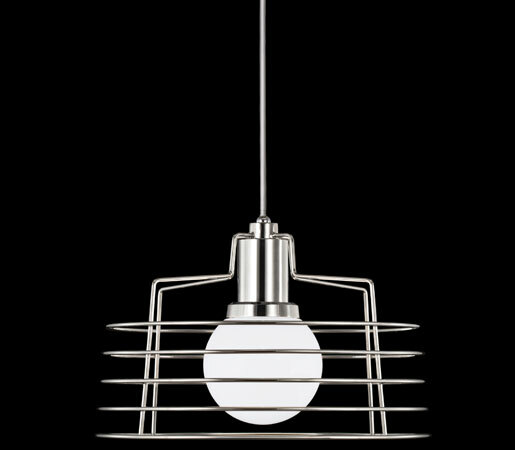 The geometry is as simple as possible, with as little clutter we could devise. 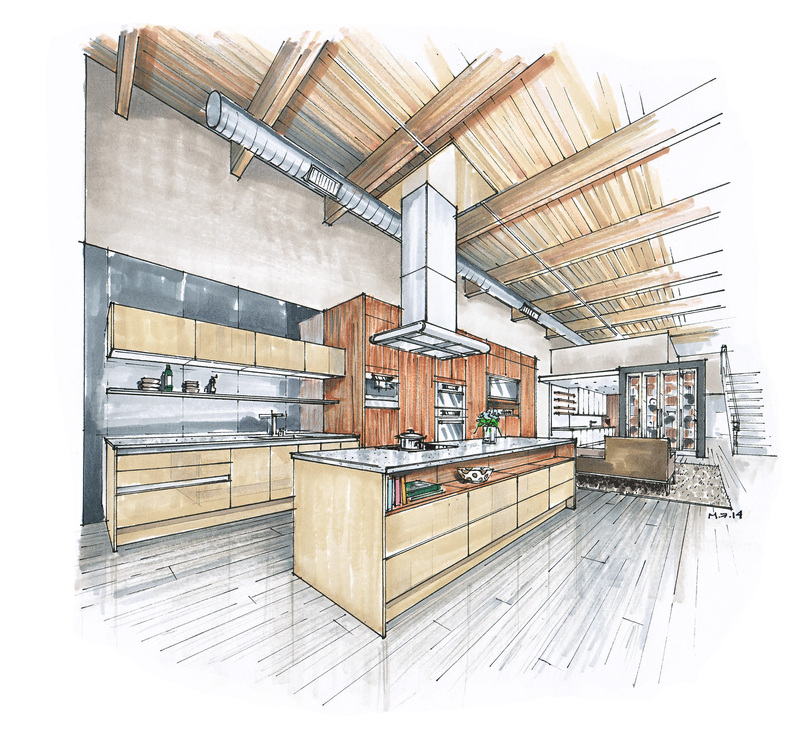 The hood is a ceiling mounted unit and cooktop a flush-mounted induction, to keep the furniture sleek and less “kitcheny”. 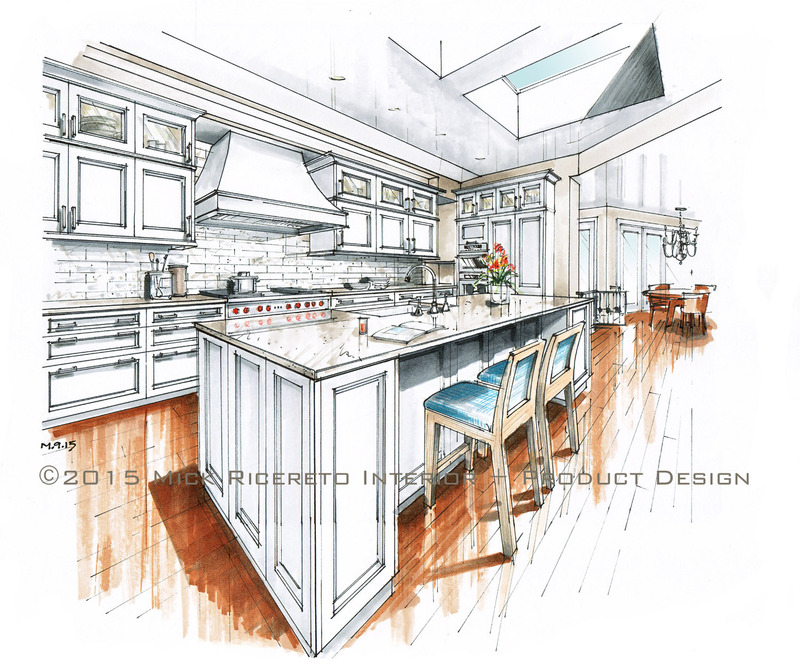 The long countertops are in a ceramic material which replicates basalt, but to a length of over 300cm. There is really no reason to consider natural stone in place of this incredibly strong, impervious and eco-friendly material. From arm’s distance you cannot tell this is a manufactured material. 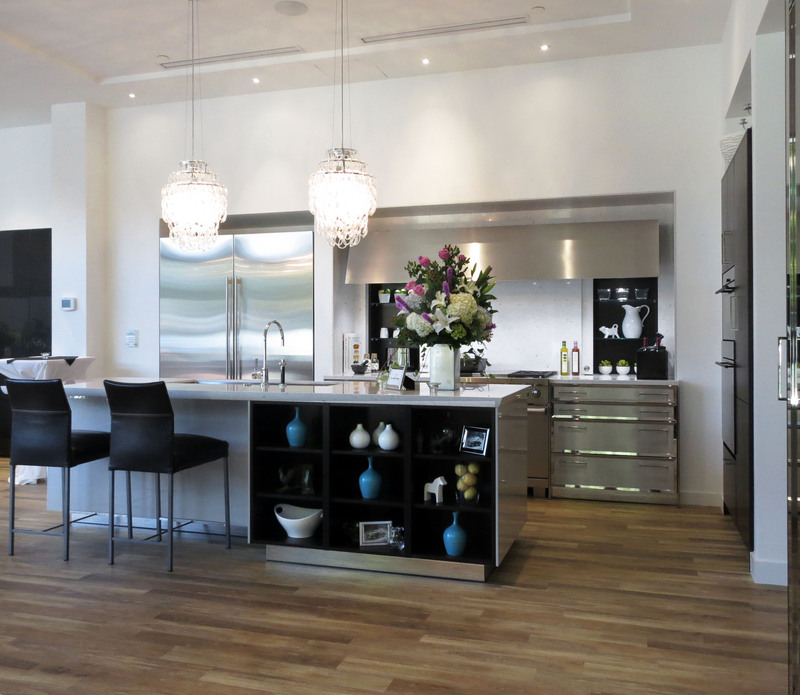 This countertop is a SieMatic exclusive, and comes in several colors and finishes. Note how the pullout cabinets have no hardware, and the faces go to the floor. 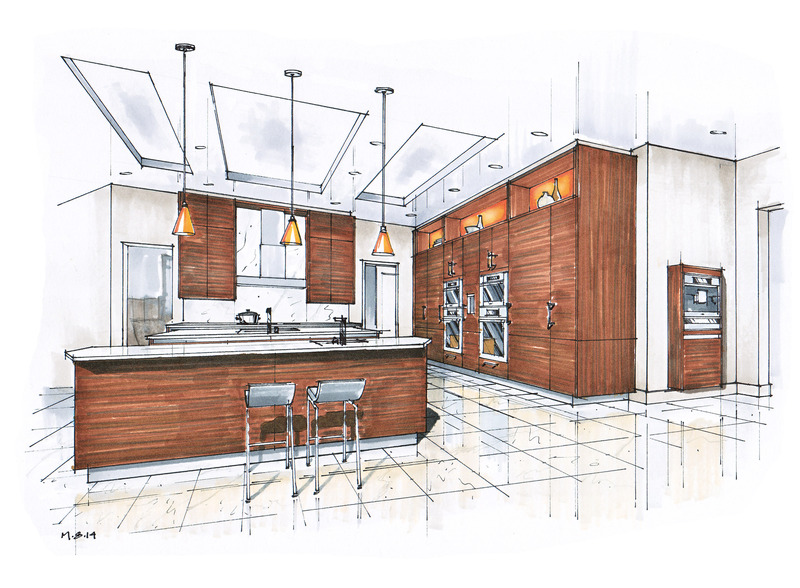 The cabinets open with electronic “touch latches”, a hugely popular trend with European kitchen design today. This display replaced another long island layout, but retained the fireplace area towards the front window. We softened the look by removing the TV and taking the bookmatched/sequenced walnut panels up to 9 feet. 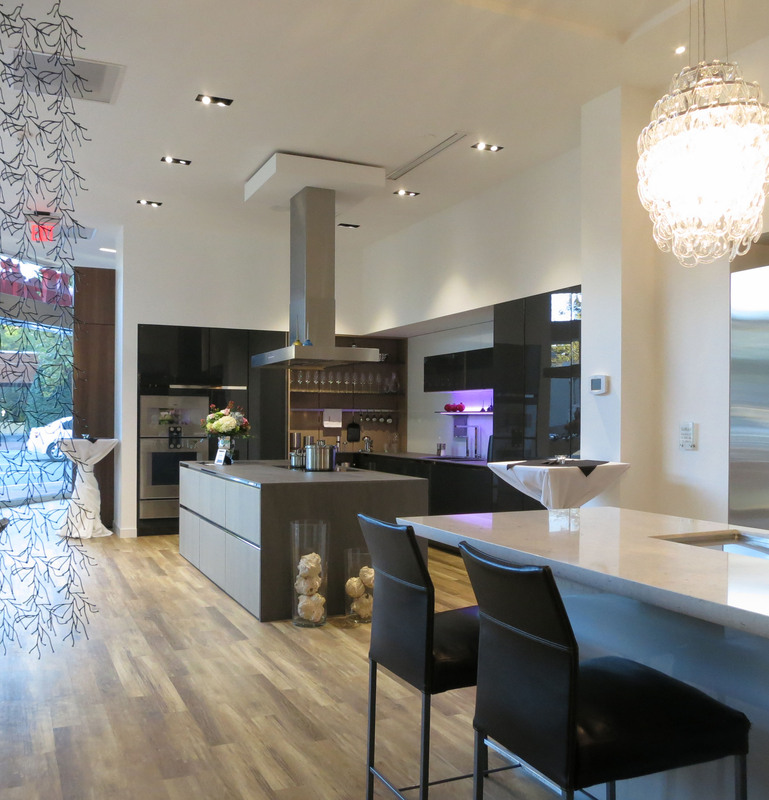 The glossy panels on the backsplash are SieMatic Graphite lacquer. The original Beaux Arts display remains in the sister window slot. With this look very appropriate to the South and with the recessed white panel design being timeless as ever, there is no need to change this display any time soon. 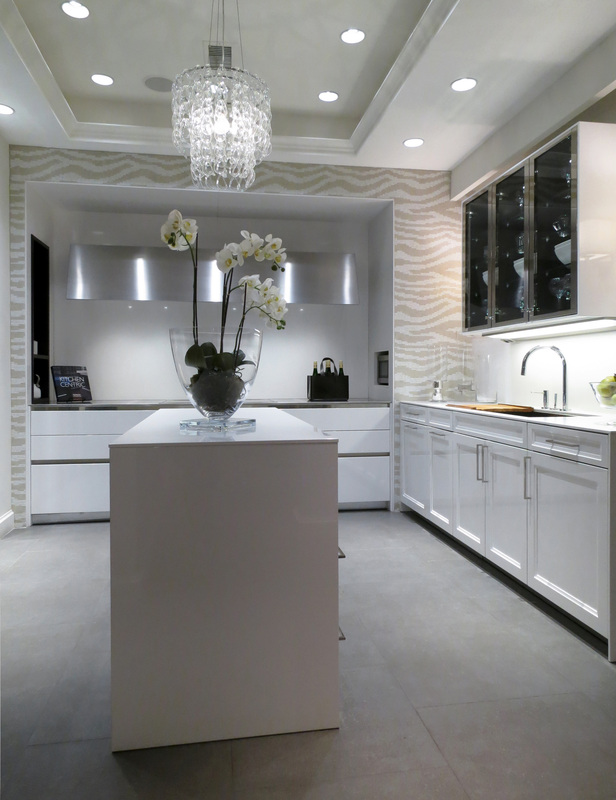 We installed a new “Sophia Loren” Beaux Arts Lotus White Gloss kitchen 2 years ago, and it remains as is. It is interesting to see how the Beaux Arts feel has changed over the past few years, with just these two displays in one location showing the depth of range one “doorstyle” can go. 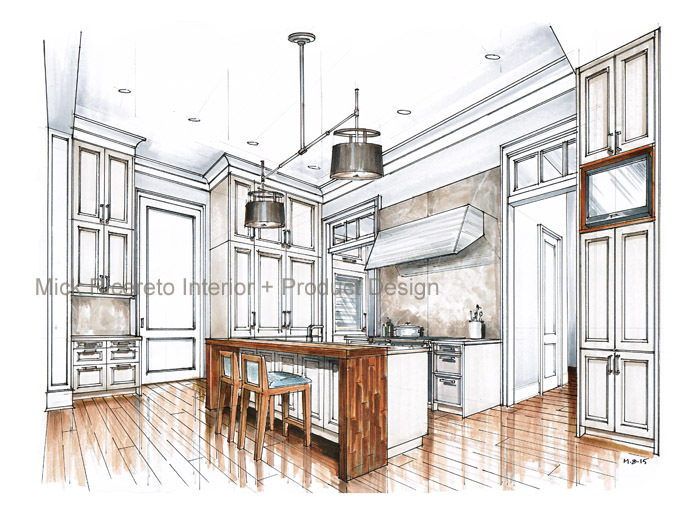 It is very much about overall feel and appointments, and not the design of the cabinet door. 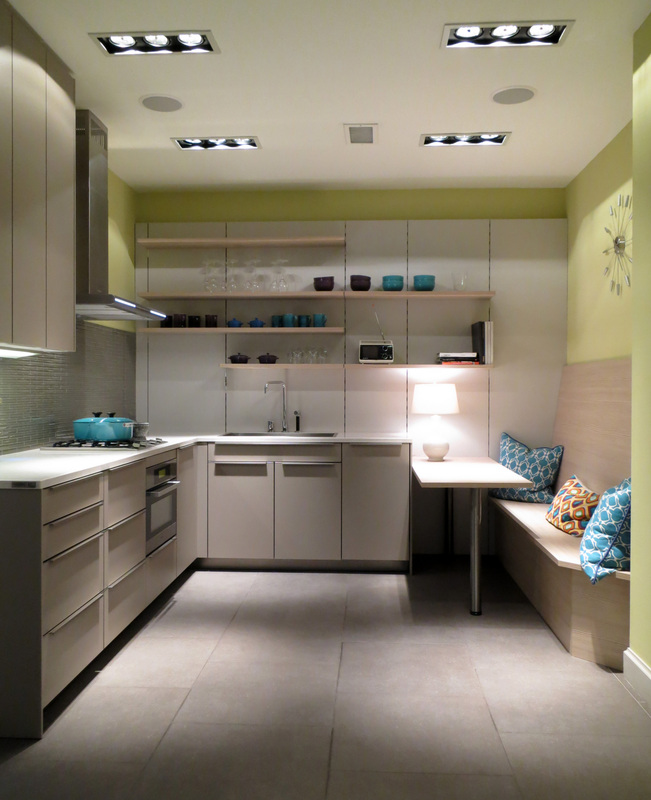 We also changed a smaller display in the back, which represents an “apartment kitchen”. Although we are starting to move away from doing smaller displays like this, it is good to show SieMatic can meet smaller budgets and still deliver world-class function and style. This display is in laminate and the price of such a design is more accessible than many would surmise. 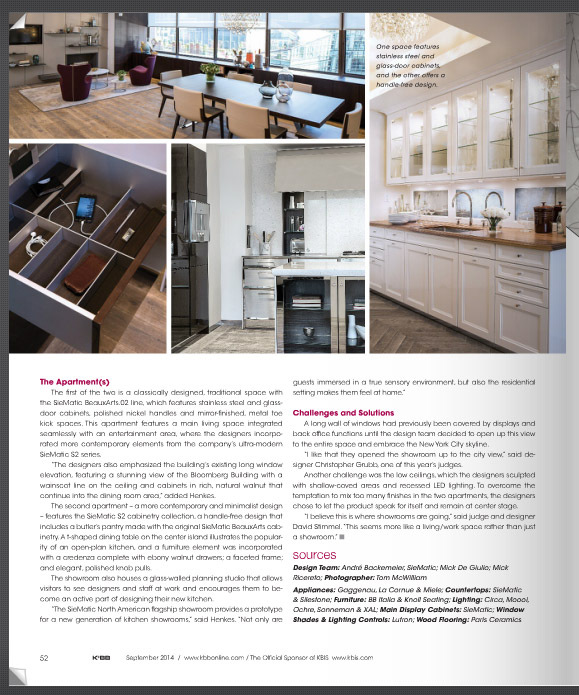 Such is a benefit of modular German cabinetry, having all the interior quality and function but choose laminate for the finish and be practical and budget-minded at once. The shelving system is called Floating Spaces, and is completely adjustable in height. Although we carefully composed the standard widths and shelf placement, it is designed to be flexible. 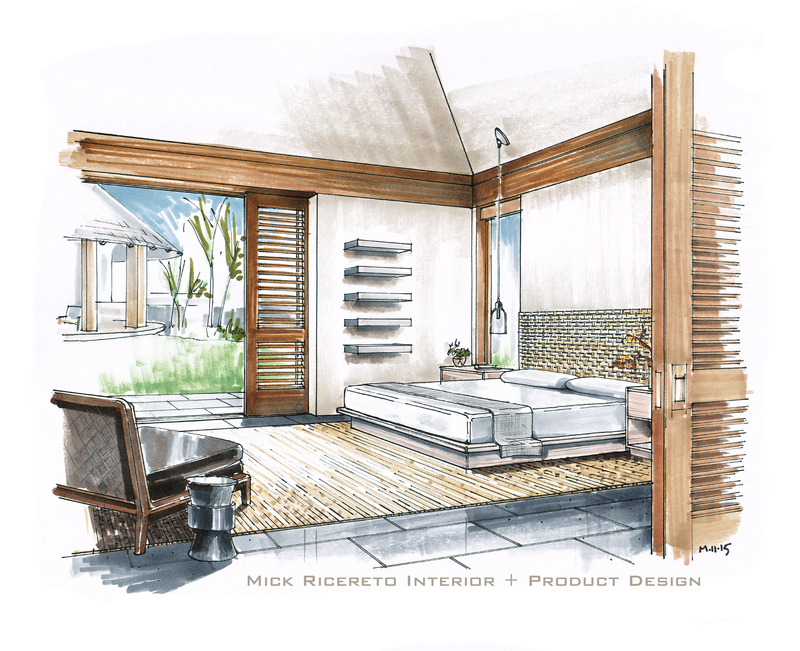 The seating is a small banquette, as large as space would allow. This is composed simply of laminate panel material. I love banquettes and in fact, if I had one at home I would be sitting in it typing this right now. 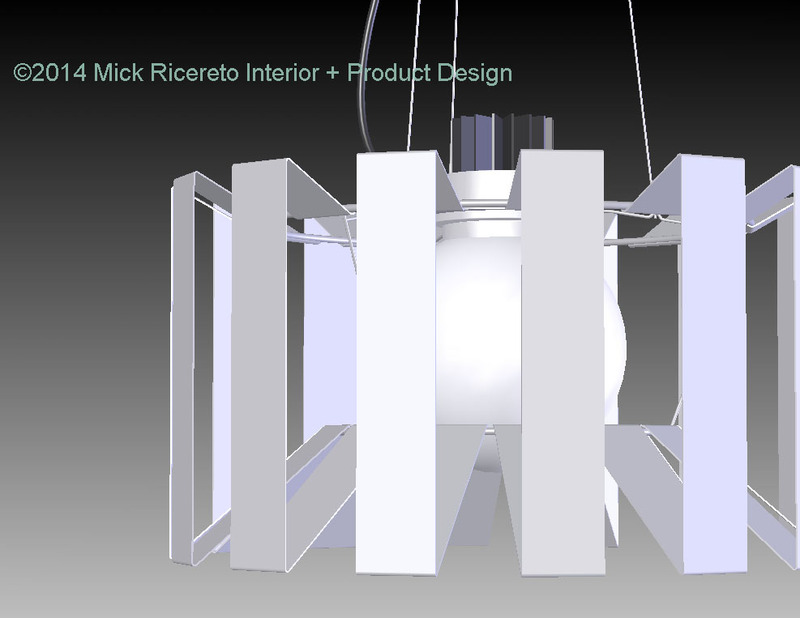 The last display also contains some Floating Spaces, integrated into a series called S2. 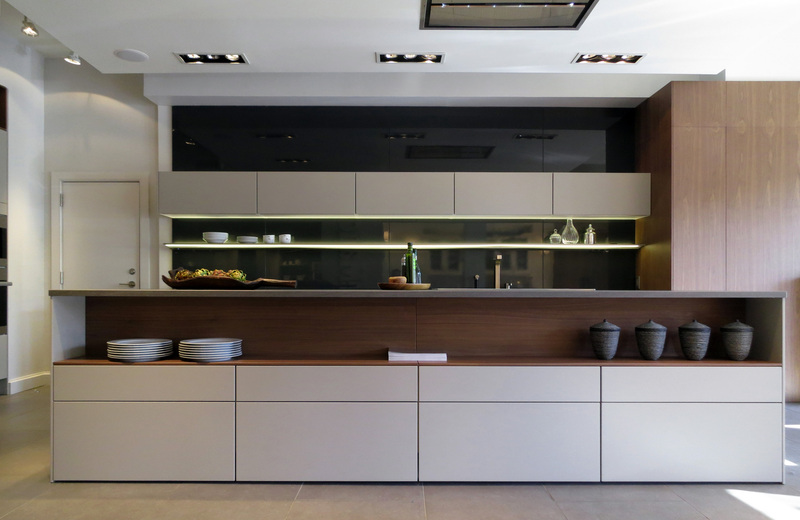 This is SieMatic’s “channel” series, of handle-less cabinets. 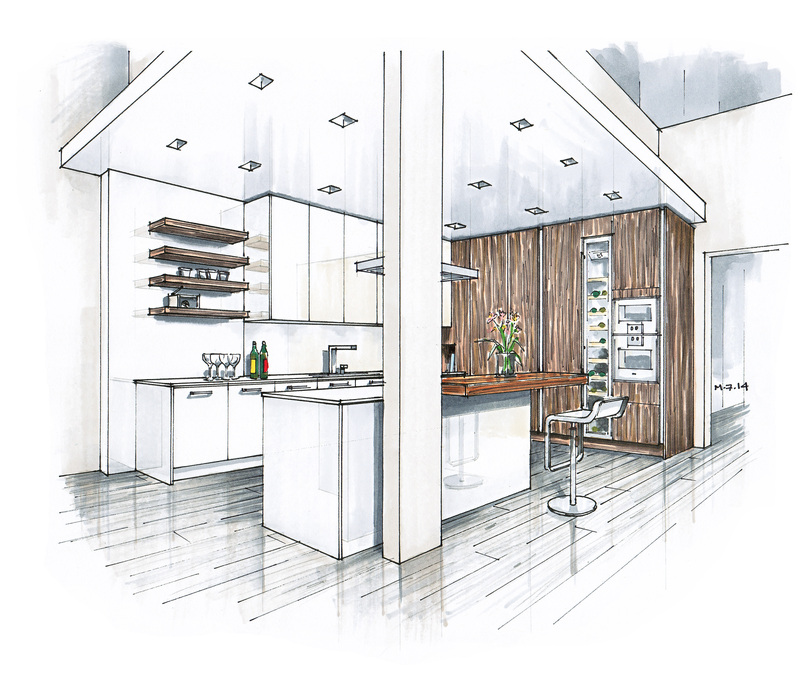 SieMatic invented the handle-free design of kitchen cabinets in 1960, and this look is exceptionally popular today. The finishes are Titan oak (a limed quartersawn veneer) and Sterling grey “similacque” laminate. This gloss laminate is so flat and distortion-free, it looks just like lacquer. I understand it is coated with a clear gloss so in fact it is really a paint finish on top of laminate, and the clarity is just simply remarkable. Combined with the “Zero” edge of the door, there really isn’t anything else that compares. At the time of installation, I had only a 35mm wide lens and this display was very wide, requiring me to do a panoramic stitch-type edit. This was before easy stitch-type apps were available, where you just follow directions on the screen … so I had to take several manual pans and edit them later. It was grueling. So, in support of manual craftsmanship, this old display photo shall take one last victory lap around the internet in honor of midnight photo edit-efforts around the world. 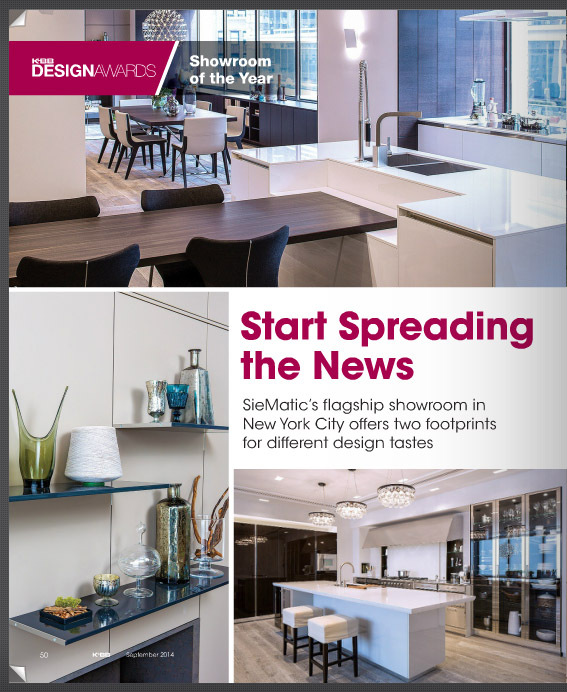 As always, working with SieMatic is a great honor and I’m looking forward to the next round of showrooms this year and beyond. 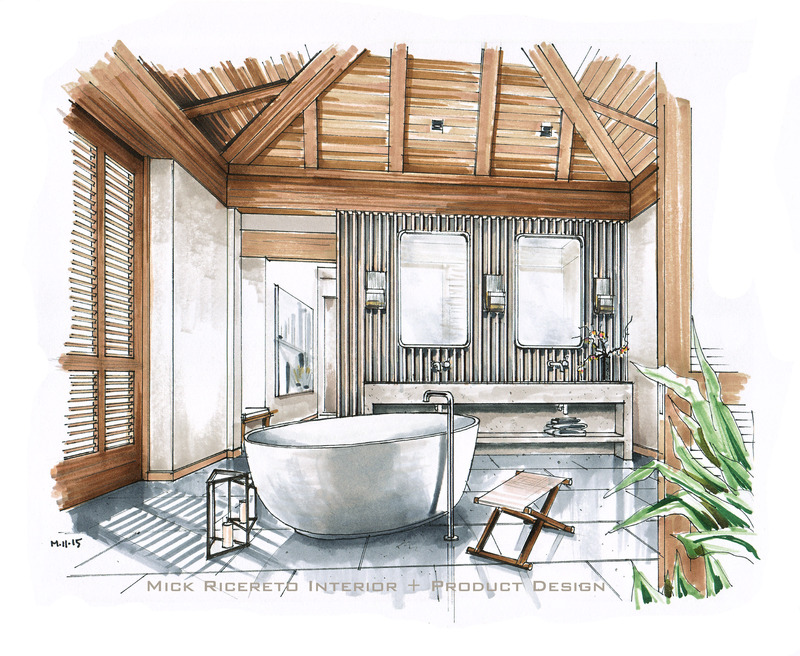 Have a look at my Facebook page for more news and links to exciting design projects.